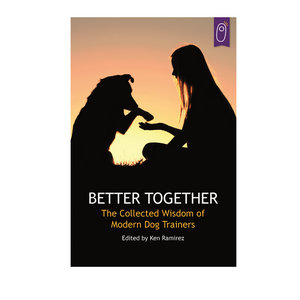 Last month at ClickerExpo Portland, Karen Pryor Clicker Training released the new training anthology Better Together: The Collected Wisdom of Modern Dog Trainers. Edited by the popular trainer Ken Ramirez, this groundbreaking book features more than 60 articles from 28 of the world’s leading positive training experts, including Karen Pryor, Kathy Sdao, Debbie Martin, and many more. Here, Ken Ramirez discusses the impetus behind the book, as well as the specific ways that it helps people and their dogs become better together! What was the impetus to create this book? Our primary goal at Karen Pryor Clicker Training (KPCT) is to help people train better. We are always searching for the best resources and best ways of teaching professionals to be the best teachers they can be. However, we also want to reach regular dog parents and provide them with useful resources. Over the past two decades, we have asked some of the finest trainers and teachers in the world to write articles for our website. The collected wisdom available throughout these articles is pretty remarkable! We realized that we had the makings of a great book (maybe several books). A few years ago, we did something similar by gathering some of Karen Pryor’s best articles into the book On My Mind. This time, we decided to explore a compilation of various authors. The target audience for this book is the everyday dog owner. This includes pet parents who want to build better relationships with their dogs. At the same time, pet parents want to learn how to use positive reinforcement to have a well-trained dog. The articles are written in a way that anyone interested in training can benefit. How is this book different from other dog-training books? I think one of the things that makes this book unique is the fact that it contains the viewpoints and advice of so many different trainers. Each article speaks with a unique voice and is a standalone piece; the reader can open to any article and gain insight and good advice. However, even though the articles are written in each author’s voice, there is cohesion within the book that comes from everyone’s belief in positive reinforcement training and the use of a clicker to communicate more clearly to dogs. How will dog owners find this book helpful? The book is very comprehensive in that it looks at training from all stages, so that dog owners can find the information they need when they need it. The variety of covered issues is broad; topics range from getting started in clicker training, teaching a puppy, and dealing with elderly dogs to teaching manners positively, preventing common problem behaviors, and working with multiple dogs. There is something for every dog and human team! What will dog trainers get out of this book? Professional dog trainers will find this book valuable because it offers articles and simple suggestions that trainers might find useful working with their clients. Because the book includes advice from so many different trainers, the experienced trainer can get varied perspectives on training. Better Together also includes several advanced articles. How were the articles selected? Selecting the articles was not easy, as there were so many excellent pieces to choose from. We wanted the book to be useful, even if a reader chooses at random, but we also wanted there to be a logical sequence where one chapter leads to another. The articles we selected provide still-current information and explain principles and applications clearly. What is the common thread among the articles? There are many common threads among the articles in this book. The most obvious connections are that every author focuses on the use of positive reinforcement and uses a clicker or other marker to enhance communication with the dog. Beyond that, there is a shared philosophy among authors where the needs of the dog are considered first, and there is a shared focus on connecting the practice of training to the science behind it. We wanted to make sure that every article embodied the mission and spirit that we teach at Karen Pryor Academy and that we share with attendees at our annual ClickerExpo conferences. In the introduction, you describe the book as a journey. Can you explain why you describe it that way? I look at Better Together as a journey for several reasons. The book starts with how to begin clicker training and gradually works its way through the various skills needed to train your dog; it’s a journey of discovery. By the end of the book, readers will have been exposed to many important aspects of training, and will find that through the application of the techniques described in the book their relationships with their dogs will have improved. Readers journey by learning how to interpret their dogs’ behavior and develop an ability to communicate with their dogs. With advice from the book, owners will find that their dogs’ lives will be improve and that the dogs will be helpful companions—making life Better Together.